Boat shaped in form, and slender long and graceful, accenting and lengthening the profile of the finger, Marquise solitaire engagement rings offer outstanding beauty, brilliance and value for money. A partially bezel set Marquise diamond engagement ring with extending V claws to secure the brilliant cut diamond. Simple stylish design. Diamond securely held at each end. Tapering shoulders. Court shaped profile. Available in 18ct White Gold, 18ct Yellow Gold, 950 Palladium and 950 Platinum. Wood boxed. Gift packaged. 14 working days delivery. Exclusive 4 claw sideways set marquise diamond solitaire engagement ring with comfort fit court profile band. Exclusive sideways set marquise solitaire design. Each ring we create in this style is created around your exact diamond specifications, with a secure 4 claw setting. This design is unique to Serendipity and takes around 4 weeks to complete. The design is beautifully balanced with slender tapering shoulders and a comfort fit court profile band. Simple, 4 claw marquise diamond solitaire engagement ring with simple wedding ring friendly setting. Elegant, 4 claw marquise diamond solitaire engagement ring with wedding ring friendly setting. Medium weight court profile ring design with 4 supporting claws suitable for most diamond sizes. 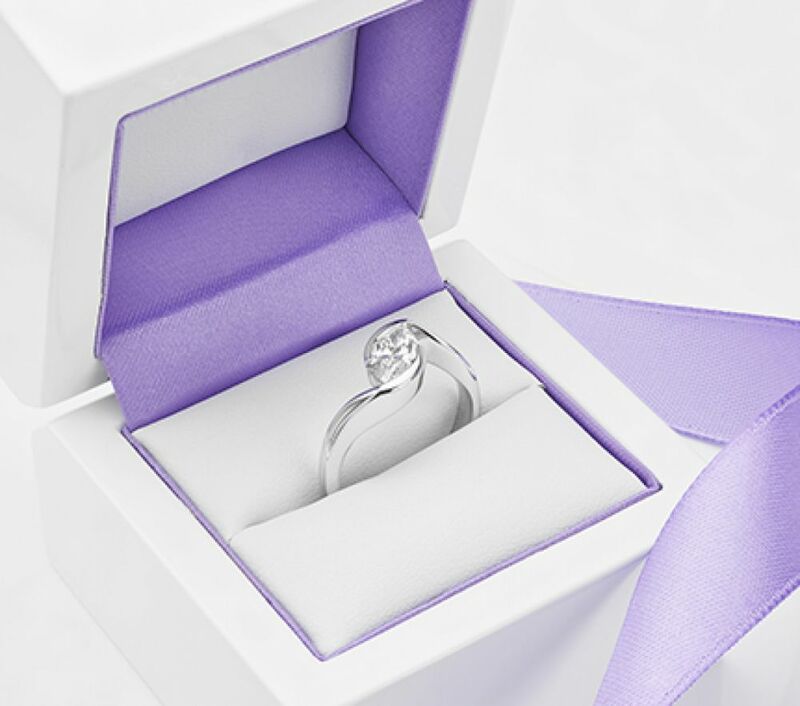 Most rings are created to order, within a time frame of around 3-4 weeks before shipping fully insured to your destination. The Irisia Marquise diamond engagement ring captivates with modern styling and a wedding ring friendly setting. Flowing from a 2.5mm wide comfort-fit band, tapering shoulders rise towards a four claw setting to hold a beautifully shaped Marquise cut diamond, available in a wide range of diamond sizes with a choice of diamond colour, clarity and carat weight. Four claw setting. Shoulder claws - For added stability. Tapering open shoulders. Wedding-ring fit. 2.5mm ring width. Supplied boxed. Gift packaged. Available in Palladium, 18ct White Gold, 18ct Yellow Gold, 18ct Rose Gold, 950 Palladium and 950 Platinum. Partial bezel set marquise diamond solitaire engagement ring, with a marquise brilliant cut diamond between full V shaped claws. Marquise cut diamond. Fluted bezel setting.Tapering shoulders. Wedding ring fit allows wedding band to fit against ring. Available in Palladium, 18ct White Gold, Yellow Gold and Platinum. Wood boxed, gift packaged. 14 working days delivery. Phoebe features a dazzling white Marquise cut diamond. The elegant design is both simple and elegant with a two claw setting above a comfortable court shaped design. This incredible Marquise engagement ring features a wedding ring friendly design to allow a perfect fit with any straight plain wedding band. The Phoebe Marquise engagement ring benefits from a court shaped comfort fit band measuring 2.5mm in width. The band rises towards a two claw setting to secure a scintillating Marquise brilliant cut diamond selected for desirably proportions perfect for this winning design. A two claw Marquise diamond engagement ring with open shoulders and wedding ring friendly setting. Unique design allows perfect wedding ring fit. Beautifully styled to display diamond. Tapering open shoulders. Available in 18ct Yellow Gold, 18ct White Gold and Platinum. Approx. 14 working days for delivery. Elegantly styled sideways oriented Marquise diamond solitaire engagement ring, featuring a simple east west setting above knife edged shoulders and comfortable court shaped band. Marquise diamond, Sideways setting, Solid tapering Shoulders, Court ring profile. Available in 18ct White Gold, 18ct Yellow Gold, 950 Palladium and 950 Platinum. Wood boxed, gift packaged. Approx. 14 working days delivery. Enjoy the unrivalled simplicity of the Venice 4 claw Marquise twist engagement ring. Styled with a sparkling Marquise-cut diamond, each shoulder tapers with elegance to embrace the diamond within a twist claw design above a comfortable court profile band, perfect for everyday wear. Twist design, Cross-over style, Court profile, Secure setting, Available in 18ct White Gold, 18ct Yellow Gold, 950 Palladium and 950 Platinum. Wood boxed. Gift packaged. 14 working days delivery. Our unique, signature Marquise twist engagement ring. The Ursa engagement ring flows effortlessly from shoulders through to the embrace of a bezel setting to surround the Marquise diamond in a distinctive twist design. This exquisite diamond engagement ring is crafted with a Marquise brilliant cut diamond. Held within a partial bezel setting, the unique design sweeps from a substantial court shaped band with grace and effortless elegance.